As the first New FH trucks roll off the production line and are shipped to New Zealand, the uptake for this new model has been unprecedented, with customers now ordering the new FH and FH16 models out as far as ten months in advance. We have had a fantastic response from our customers and significant new enquiry from throughout New Zealand and that has resulted in a solid order bank. Clive Jones, National Sales Manager for Volvo Trucks at MTD, states our staff are working incredibly hard during this busy period to respond to the level of interest and to lock down build space quickly. Our aftersales teams have undergone extensive training and we are ready to go as the new trucks enter service. The first two trucks arrived late last year and have been utilised for technician training and market proving tests comments Jones. Market proving is essentially checking our selected specification is 100% right for New Zealand. We have the unique capability of being able to build our trucks for New Zealand’s needs, our roads and our applications at the Volvo Trucks Brisbane, Australia plant. Having market proving trucks allows us to test the vehicles and fine tune them to ensure we deliver the best possible solutions for our customers. Having the factory so close and being able to communicate in a similar time zone with English speakers is hugely beneficial to us. We spend a lot of time working on the small details and guiding the factory around our wishes and local customer needs. Among the first trucks to arrive in New Zealand, will be a chassis destined for one launch customer, Freight Lines Group, which will include trucks intended for both the freight and livestock fleets. We are very proud to continue the long standing Volvo relationship with Freight Lines Group says Jones. Freight Lines were included in a select group of Volvo Trucks customers who visited Sweden two years ago during the design phase of the New FH to provide feedback and advice. It’s great that in a market as small as New Zealand a leading operator is taken notice of when it comes to design input. Managing Director of Freight Lines, Peter Barker comments ‘Volvo has been good to us with over 20 years of service in our fleet and with more than 170 examples purchased in that time. From a driver perspective, the comfort and safety is second to none and we get good support nationwide from Clive, his team and the service network. We look forward to this next generation joining the fleet. If they are as good as the last ones, we’ll be happy’. The New FH models come with a completely new cab and a range of new features both in terms of safety, driver comfort and operating efficiencies. 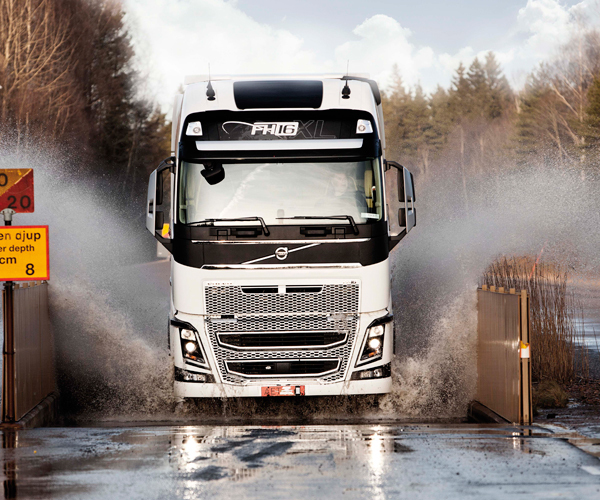 The new trucks are the first totally new FH since the model was first released in 1994.